I keep getting errors about the REST API Path being invalid. What do I do? There are two common reasons for this error. First of all, check if the REST API module is enabled (along with other three modules listed in the Requirements section) - log in as administrator into your Gallery system and navigate to the Modules screen. Make sure each of the required modules is selected with a check mark next to their name. Second, make sure you have entered the REST API path correctly. The default path for the majority of Gallery installations is /index.php/rest, however if you have redirection rules hiding the "index.php" part from the URL, then your path would be /rest. You can find out if you should include "index.php" in the REST API path by clicking the "Home" button in your Gallery. If the URL in the address bar shows "index.php", then your REST API path is definitely /index.php/rest, otherwise you have redirection rules in place - the REST API path is /rest. In response you should get a blank page with two square brackets  in the upper left corner, and the URL in your address bar should remain unchanged (to make sure no additional redirects take place). Restart Apache and try uploading again using the flash uploader. If you are able to upload using the flash uploader, try uploading from Lightroom using the Gallery plug-in. Another frequent cause of upload and connection related errors is the mod_security module. mod_security is an Apache module that provides intrusion detection and prevention for web applications. It aims at shielding web applications from known and unknown attacks, such as SQL injection attacks, cross-site scripting, path traversal attacks, etc. This all sounds good, however, when poorly configured mod_security can also shred totally innocent and legitimate requests. When this happens you can experience all sorts of trouble ranging from server errors ("HTTP Error 400 Bad Request" and "HTTP Error 500 Inernal Server Failure") to seemingly random alterations and disappearance of API requests. If you have your own server and can configure it at your will I recommend disabling mod_security, at least to check if things start working as expected once your take mod_security out of the equation. 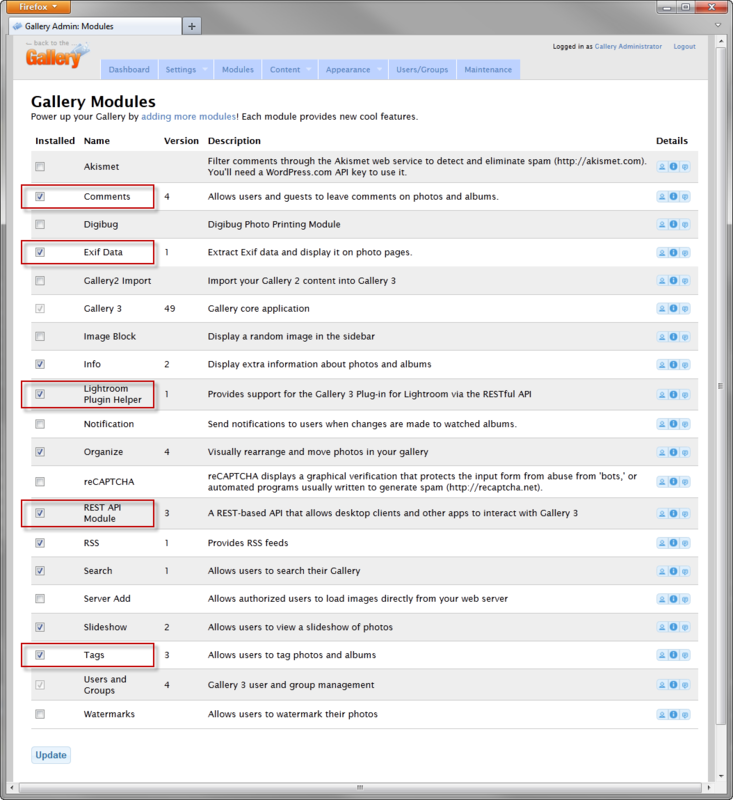 Then you can work on configuring it correctly so it does not interfere with the Gallery API. The maximum file size the Gallery application can process depends on your PHP settings. If you are uploading very large photos (larger than 3600px long @ 100% JPEG quality - not sure why you'd want to do that), you need to increase the post_max_size parameter, which by default is set to 8MB. 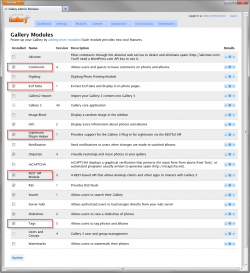 Do I need to make any changes in my Gallery installation? The Lightroom Plugin Helper module can be downloaded using the link in the side bar. What do Gallery Options do? Manage only my own albums - useful when you have multiple users uploading their photos to a single Gallery hosting environment. When this option is selected, each user will be access only the album they created. Hide albums I have no access to - when this option is selected the plugin won't show albums you have no "edit" and "create" permissions for. Create develop snapshots on Export / Publish - with this option selected, each export or publish operation creates a Develop Snapshot (available in Lightroom on the Snapshots panel within the Develop module). This option is useful only if rely on Snapshots in your workflow. Reduce memory usage on the server by requesting albums N at a time - this option helps overcoming the dreadful "HTTP Error Code 500" which may happen when you have large albums containing hundreds of photos. Simply by requesting the album list in smaller "chunks" help to keep memory usage on the server under control. Throttle interval for server requests - This option is useful when performing massive updates on the server which can bog it down and possibly affect other users. With the throttling option enabled you can spread your server request over a larger length of time, so the server gets a chance to process other users' requests. Got another question? Didn't quite get the answer? Ask alloyphoto@alloyphoto.com, so I can improve and expand this section. This tool does synchronize photo's and some of the metadata. It does not synchronize all of the keywords or tags how come?? Check if the keywords that don’t get exported are actually marked in Lightroom as “Include On Export”. I can't log, Lightroom says there's a security error with the certificat of my website that is maybe invalid. So we have generated a new certificat but the error is still here.